This approach has made Mark one of the UK’s leading personal injury solicitors who in recent years has recovered in excess of £20,000,000 in compensation for clients. 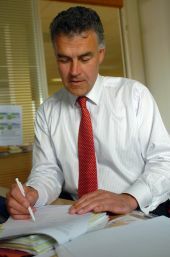 Mark Thompson is a member of the Association of Personal Injury Lawyers. Mark Thompson Law is a solicitor practice authorised and regulated by the Solicitors Regulation Authority – SRA number is 471045. You can see what clients say about Mark at Legally Better. Bachelor of Laws with Honours from Liverpool University 1980, and College of Law 1981. Qualified as a solicitor in 1983 having completed articles with John A Behn Twyford & Co of Liverpool. After partnership with John A Behn Twyford & Co in Liverpool moved to Bond Pearce at Plymouth and Exeter to become partner and head of personal injury and medical negligence. Set up own practice, Mark Thompson Law, in 2007, to specialise in those personal injury and accident cases requiring his experience. I have trained, managed and supervised solicitors and have wide experience of accidents at work, industrial disease, car accidents, motorcycle accidents, cycling accidents, pedestrian accidents, product liability, and the full range of injuries caused. Researching to set up a PI Trust isn’t an enjoyable thing to do, the reason you need a trust is due to misfortune in one of its many guises and you are therefore most likely not at your best. I found Mark Thompson Law through an internet search and I can only say that I wish I had discovered them sooner. I’d spoken to a couple of other solicitors about setting up a trust and found they were relying on out of date information and charging a small fortune for the service of setting up a trust deed. After speaking with Mark my concerns were allayed, he is very professional, approachable, clearly up to date on how trusts work and I found no question was too big or too small for him to answer, he really helped ease the process of setting up the trust deed and offered sound advice. Excellent service. Significantly less expensive than my own solicitor. This message is with heart felt gratitude to Mark Thompson to say a huge thank you for all his advice, guidance and assistance. Mark Thompson has been an outstanding solicitor, always on hand to help and it is with deep sincerity I am thanking him for helping me set up a Personal Injury Trust Fund. From the very first phone call I felt an instant honest, genuine and comfortable rapport with him. His effort and professionalism in my matter has been very much appreciated. I highly recommend Mark’s legal professional service due to his expert knowledge. He has proficiently managed and responded to my requests without any delay. He has also ensured I comprehended the advice that was provided to me by translating legal speech into simple English terms. Mark has delivered an exceptional service and I cannot thank him enough for elleviating a lot of stress. I could not ask for a better service from him and I want to take this opportunity to wish him every success in his future endeavours. Once again thank you very much Mark for the first class professional service.